Earn $22.89 in Rewards credit (2289 points) What's This? The Rival22 DoubleTap Shifters make SRAM Rival's 11 speed shifting possible. With the introduction of Rival 22, SRAM's economically friendly group makes the move to 11 speed and couldn't do it without these shifters. For excellent performance, these utilize ZeroLoss™ technology which engages the cable instantly during up or down shifts for instant and precise gear changes. As with all of SRAM's road groups, the Rival 22 shifters use their unique DoubleTap system to shift up and down with the same lever. This system totally separates braking and shifting, eliminating accidental shifting while breaking; makes for a more comfortable shifter with more viable hand positions; and a more durable setup with less parts susceptible to damage. Durability is further improved by the use of aluminum brake levers and shift paddles. While performance was a top concern when designing the Rival 22 Shifters, SRAM also made sure that they were comfortable enough for hours and hours of problem free use. Taking the Red 22 Shifters as inspiration, these use the same ErgoFit™ design for optimal ergonomics and the same textured body for excellent grip. Reach Adjust™ also lets the rider customize these shifters to their particular hand size for a customized fit. 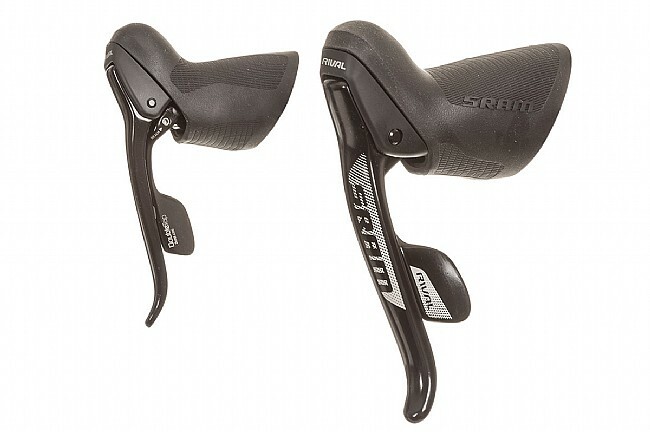 With these shifters from SRAM, you really do see the benefits of trickle down technology and enjoy the perks of much costlier units without the big price tag. The Rival22 DoubleTap Shifters come as a pair (right and left units). 332 grams (claimed). Compatible with SRAM's other 11 speed road components.